Currently WoWHead doesn't have complete data about this achievement, which is why the recipes aren't showing up. You can find them on the first achievement in the series. There are 46 recipes on the list, which means you need to be able to cook all but one of them for this level of achievement. This is the only one I'm worried about for the title. It could take some time to get 45 recipes especially if some are rare daily drops like the lager and stormchops were. Currently, there's no information on where the above 4 recipes drop or how they are obtained. List of recipes, and somehow where to get indegredients. Note i made it only based on wowhead data. Northrend Gourmet requires cooking 45 northrend recipes. There's a maximum of 46, but at the moment 4 of them appear to be unavailable (Succulent Orca Stew, Kungaloosh, Fish Feast and Shoveltusk Soup), rendering this achievement impossible. Let's hope Blizz picks up on this fast and fixes it. YES! Thank you for doing this list, mate. There is a "Kungaloosh" reward from a quest in SBasin, but as of now, no recipe. There are 4 quests in the game (in Howling Fjord, Borean Tundra, and in Scholazar Basin) that reward the food/drinks you're supposed to make for the achievement. I've heard that in the Beta these quests also rewarded the recipe to learn and make those foods/drinks. They've unfortunately been removed in the final version of WotLK, and the achievement has not been modified yet. i just wanted to point our that it says i only need to cook 15 of these recipes for the achievment idk if wowhead made a typo or what but i only need15of these recipes total. 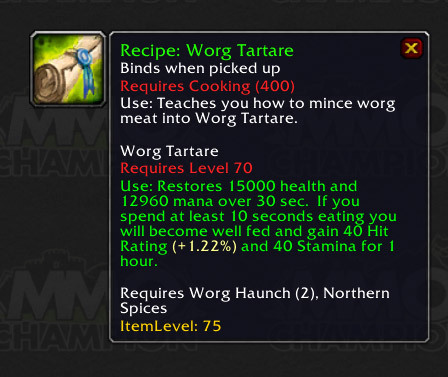 In the latest PTR build, this achievement has gone back up to cooking 45 recipes, as they added a brand new recipe: Worg Tartare (purchasable for 3 Dalaran Daily Cooking Awards from the usual vendor). This recipe requires 2 Worg Haunches and a Northern Spice, supplies the normal amount of healing and gives you a well fed buff of 40 hit rating and stamina. Happy Cooking! Enjoy your achievement and for most probably also the Chef title! This post is wrong. Shoveltusk Soup and Succulent Orca are out next patch (and not currently in the game), and a new recipe is being added. They have (apparently) changed Small Feast and Gigantic Feast from going green at 437 to 450 in 3.0.8. So don't waste your Spices getting to 450 before then. Just collect all the mats and wait. The Chef title is now obtainable with the new patch! Kungaloosh - From a quest given by the Washed-Up Mage in Dalaran sewers. Worg Tartare - From the Recipe vendor in Dalaran, Derek Odds. This achievement requires 23 recipes that cost 3 cooking awards, and 1 (Fish Feast) that costs 5, giving a total cost of 74 cooking awards. In the worst case, this means it will require 74 days of cooking dailies, though in practice you can expect to shave some of that time off via Mustard Dogs! and an extra award hidden in your Small Spice Bag. You should expect this achievement to take about two months. You can't rush cooking! The Worg recipe can be picked up in the sewers from an NPC that you have to talk to through the grate in the sewer. Not one of the normal NPCs or vendors. Actually, it's the Kungaloosh recipe that is from the NPC in the sewers. The worg recipe is from the vendor in the kitchen. For those who are wondering what "feast" is in the listing for this achievement, it is "Great Feast". Hopefully this will same someone some time. Happy cooking everyone - hit the remaining ones in my list of 45 today! BTW...by "feast" they mean Great Feast. This caused me a tiny bit of confusion. 1. Dreadsaber Mastery: Becoming a Predator -- You only need to do this quest and no more to unlock everything. 1. Rhino Mastery: The Test -- See comment for above quest. 3. The Taste Test -- Reward is the drink Kungaloosh - NOT THE RECIPE. 1. Fletcher's Lost and Found -- This is where you learn Kungaloosh! -- WOOT RECIPE. Definitely the longest chain for a cooking recipe, but it's totally worth it. Not to mention you can buy all the ingredients fruit vendors in major cities. The one that seems to be killing me is the Chef de Cuisine. I'm at 130 of the 160 recipes and comb the AH just about every day for new ones but having crap luck. Not even sure where or what to do next. How the heck do you come up with 160 recipes? And I've checked the neutral AH as well. I do think it was funny that, although not in the patch notes, they did re-add this to the cooking achievement, but have not yet determined how to obtain the recipe. However the recipes that use to be Horde only are now also available to the Alliance and vice versus. Anyone wondering about getting the this achievement for the Chef title, when I cooked all the recipe aside from the shoveltusk soup I got credit for the full achievement. This was the last one I needed for my warrior and was worried that I would not be able to get the title. has anyone else had problems with Spiced Wyrm burger? i've noticed u can buy spiced WORM burger from the vendor but not spiced WYRM burger, which is needed for the achievement? have blizz messed up somewhere with their spellings? Where is the recipe for snovletusk soup? I just wanted to point out a few things i have found out while going for my chef title, Im sure as someone here has said, Two of the recipies on this list are spelled wrong, both involving the spelling "Wyrm" Instead of "Worm". I looked for these for about a week before seeing a post on wowhead about "worm delight" being spelled wrong in the achivement! As well as there is no recipie any more for Shoveltusk soup any more in game, dont worry, the achivement says cook 45 of them, and counting the soup there is 46 on the list, happy cooking and i hope you have better luck than some of us going for the "Chef"
Wanted to post this down here for those who dont scan each and every comment looking for the answers to their questions! There is no way to speed up getting this achievement as a majority of the 45 recipes call for Cooking Awards which are only obtainable through the Dalaran Cooking Quest. Patience is a virtue. I finally got this achievement done and have now my Chef-title. I was missing recipes for Bad Clams and Tasty Cupcake. For Children's Week I made some Cupcakes and didn't realise at then how that recipe had appeared there when it never had dropped for me. Yesterday I noticed that strangely I only needed Bad Clams for the achievement and to my suprise I had somehow learned the recipe! Can anyone confirm these drop recipes just appearing? Or have I been grinding them in my sleep? Strangely enough nobody mentioned that this acievement now only requires 15 cooked dishes to complete. Now you don't even have to buy recipes with Dalaran Cooking Awards to get it. All recs I used were either trained or dropped. That info was false :( I did get the 'Northrend Gourmet' achievement after cooking only 15 of Northrend recipes, but it doesn't count for 'Hail to the Chef meta'. Since 3.3.5 there is "you need only 15 of these recipes" or something like that. And it count to meta. The few lists others have made were wonderful, but to farm all the stuff to get this achievement, I made this list by zone so you're not running back and forth like a chicken with its head cut off! Hope this helps. 7 Chilled Meat drops off all animals in Northrend, will get plenty while gathering other meat. For everybody who want to complet it in legion don't do it the 4 emotion recepies don't drop or have a extreem low drop change. i have been farming them on my main mage lvl110 for months not 1 dropped, just lvl a 60 alt and farm them, got them in less then 1h.